Polish artist NeSpoon frequents Oak Beach along the Baltic sea every summer for a holiday. But last summer the artist decided to turn her vacation into a work of art by introducing “street art” to the beautiful beach. Far from tagging the rocks with unsavory words or images, the artist, known best for her creation of doilies as stencils, instead adorned areas along the water with the beautiful pieces made of lace. 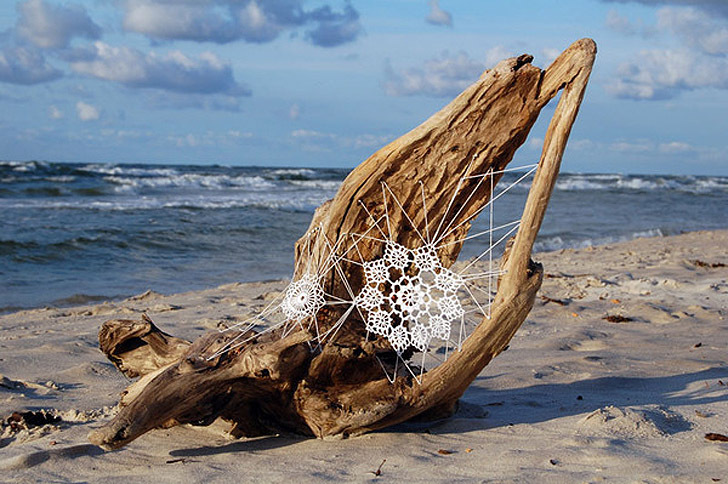 Though very delicate, the doilies survived on the beach over a week, but more amazingly, they helped highlight the natural beauty of the beach remnants, often ignored for the ocean and game and food-laden folly. NeSpoon’s installation drew in plenty of curious eyes who even took pictures of and with the installations. Fixed to everything from broken tree branches to rocks and more, visitors to the beach turned the installation into an interactive endeavor by moving the pieces around from place to place, and even using them for the construction of beach camps. NeSpoon's installation drew in plenty of curious eyes who even took pictures of and with the installations. Fixed to everything from broken tree branches to rocks and more. Visitors to the beach turned the installation into an interactive endeavor by moving the pieces around from place to place. Some even used them for the construction of beach camps. The doilies are a delicate addition to a beautiful environment. Despite sometimes rough beachside conditions, the doilies carried on for a week. Curious to those of all ages! NeSpoon's installation drew in plenty of curious eyes who even took pictures of and with the installations. Fixed to everything from broken tree branches to rocks and more, visitors to the beach turned the installation into an interactive endeavor by moving the pieces around from place to place, and even using them for the construction of beach camps. Appearing as a natural extension of the landscape in some cases. The artists installing one of her pieces. All the doilies are handmade by NeSpoon. Affixing the doily to a a stray tree trunk. A small iteration hangs peacefully between branches.